The waterlogged sounds from the Big White Ball faded as it rose into the air and it raced rapidly towards the Wabbit and Lapinette. They braced themselves for the inevitable impact. But instead of a muffled roar they heard a swooshing sound of metal gliding on metal then a double clang. The Wabbit didn't hesitate. He gripped Lapinette with one paw and a grab handle with the other as Nine the Tram hoisted them on board. The Wabbit seized the control handle and swung it viciously as far as it would go. "Difficult enemy?" asked Nine. "It's a pest," said Lapinette grumpily as they narrowly missed a large sign warning of Danger. Nine released a burst of compressed air. "Where would you like to go?" "End of the line," said the Wabbit. Nine fired another burst of compressed air. "On this particular occasion, I don't have a specific route." 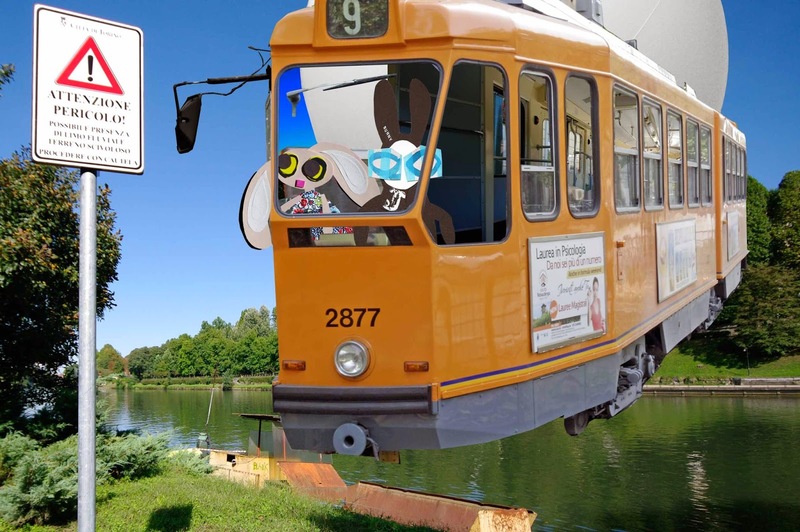 "Take us out past Corso Svizzera," yelled the Wabbit. "There's no need to shout," said Nine. "I have very good hearing." The Wabbit wasn't certain whether he owed Nine a favour, or if it was the other way around. He chose the second option. "Pick up Skratch and Wabsworth. We need a pow wow." "Anything else?" asked Nine. Lapinette broke in. "Could we stop at a caffè for aperitivi?" Nine giggled in a rather a pleasant and mostly sonorous tinkle. "Scenic spot?" "Da portare via!" shouted the Wabbit. "Subito!" said Nine.